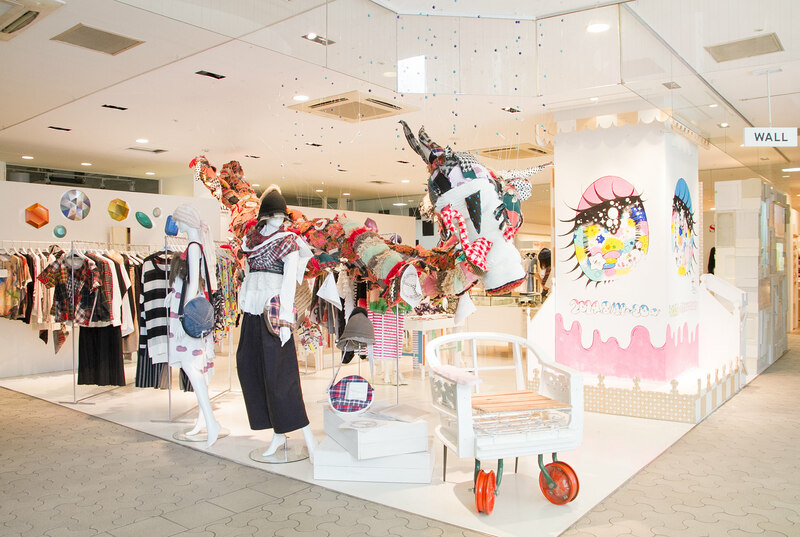 “WALL” is a select shop located at the entrance of Laforet Harajuku, the center of fashion.This shop makes a variety of expressions using people, items and space based on the concept of “Tokyo”. “WALL” was renovated in June of 2014 with white-themed fixtures from the creative unit "magma" by Jun Sugiyama and Kenichi Miyazawa spread out throughout the interior.The large wall which is a symbol of the store is still here after renovations. Now visitors can enjoy project mapping by the video director Takuma Nakata. Typical brand names of this shop include Tokyo brand names such as " NOZOMI ISHIGURO " and " MIKIO SAKABE ” along with other highly creative brand names in Japan and overseas.This shop is also called the “extreme front row of fashion” due to reasons such as offering overseas brand names which were selected for their potential for a limited time and striving to incorporate newer brand names. “WALL” is constantly changing enabling you to experience what is currently happening in Tokyo.They also offer snapshot magazines such as the Japanese “TUNE” and “FRUiTS” along with the Korean "CRACKER".WALL” continues to be the center of information on Asian fashion culture.“WALL” which enables you to experience what is currently happening in Tokyo may soon become the iconic shop of Asia.